Today at about 1030 hours, two drug peddlers identified as Navin Pradhan, 27 years ,s/o Pramod Pradhan r/o Jalpaiguri W.B. 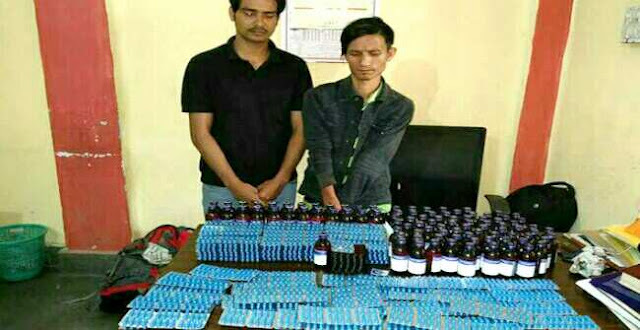 a/p near Tadong School Gtk and Laxuman Manger, 24 years ,s/o Late Man Bdr Manger, r/o Near Tadong School Gtk, were intercepted at Rangpo CP with alleged possession of 2640 capsules of Spasmoproxyvon capsules in file, 300 tablets of Nitrosun 10 and 97 bottles of prohibited cough syrups, following which a Rangpo PS case vide FIR no 31/2017 DTD 02/05/17 under relevant sections of SADA 2006 has been registered against the accused persons. They were travelling on Siliguri Gangtok bound passenger bus bearing no WB 73C/7654, Sakuntala.